A look into on how HTML5 standard is being elaborated, and what makes a standard successful. The original discussion on the introduction of the img tag in HTML. A pamphlet against the XHTML norm, seen as being decided unilaterally by the experts. An interview with artist Evan Roth, who has created the GML, a language for describing Graffities. 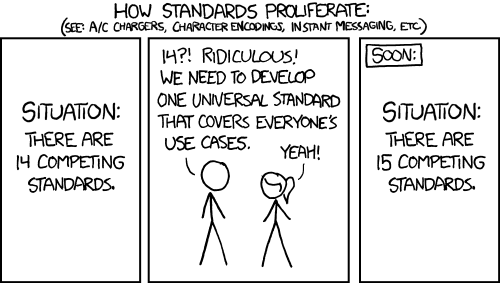 An anthropological view on the elaboration of open standards? A text looking into the task definitions/workflows implied the standards. Were there graphics made collaboratively before digital networks? Graphic designer David Reinfurt walks on the traces of Muriel Cooper, a digital designer and educator at the MIT concerned with/about de/re-specialization, technology, means of production etc. Linux creator Linus Torvald presents GIT, a tool he has created to collaborate over the network. He explains his choices and presents his ideas about collaboration, trust, network . A timeline of Networked Art, from 1921 until nowadays. Interview with Harrisson, one of the co-conspirators in OSP adventure. This article will deal with four questions which all together show that there is arising a problem for artists, for cultural life in third world countries, and for the public domain which deserves the unhindered access to the cultural heritage of the past and the present. A manual dedicated to help people setting up open source projects. Not only it gives practical insights on best practices but also it gives an interesting view on what is at stake in Free Software from a more political, culture and anthropological point of view. Texts more anchored in collective practice? in the history of graphic design, is there any striking examples of collaborative practices? Feminist patchwork collaborative art. Women’s house Chicago. Version Control for designers. Subversion Client for the Adobe creative suite. Proprietary. Tim OReilly on web apps and why they always win over deskt aps? ultra-low print on demand: DIY culture. What’s Left, book about the exhibition of Dave Hullfish Bailey at Casco in Utrecht. The web has changed our perspective on creative production; work has become networked and distributed, challenging conventional ideas about specialism and professialism. It has changed the relation between users and producers: end-users become pro-users, or at least in theory. What does it mean when we make on-line and off-desktop, and how do we respond to the inextricable linkage between technology, content and form? What assets would we need, what tools can be re-applied, changed, connected together?